Subtle variations of pattern, material, order and scale create a thoughtful platform for viewing art at this contemporary art museum on the campus of Johnson County Community College. This facility houses a large and growing collection of late 20th Century art as well as changing exhibits with national reputation. 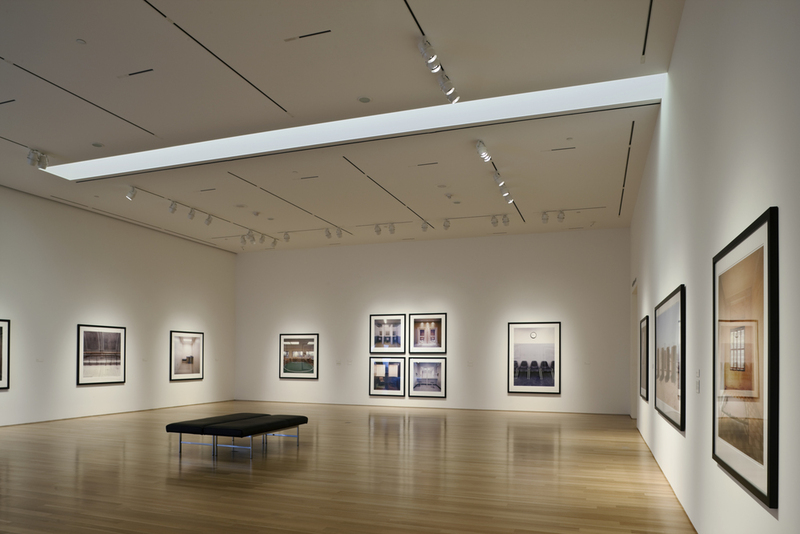 Recessed track lighting is used throughout all gallery spaces and carefully organized with other building systems devices. 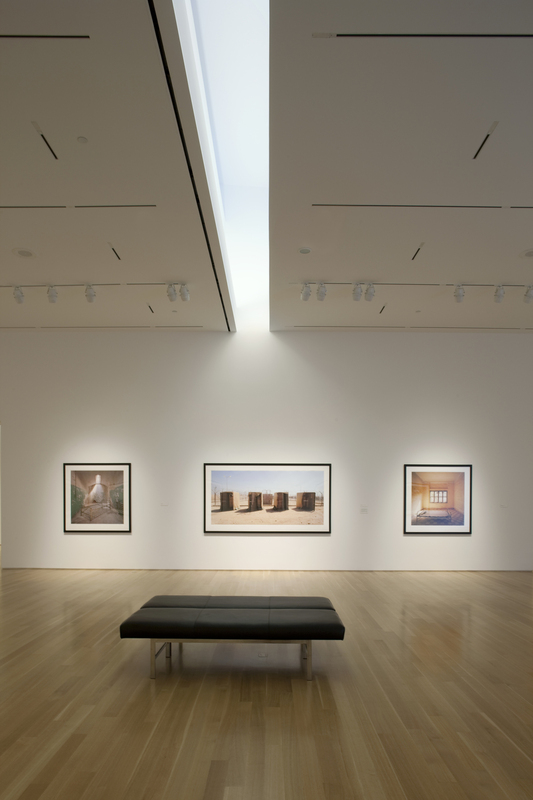 Select galleries also incorporate cove lighting having both daylight and electric light sources. In contrast to the linear patterns and accent illumination in the gallery, the entry lobby, with panoramic views of the campus grounds, is illuminated ambiently from recessed downlights organized in a regulated grid pattern. This change in fixture layout and illuminance pattern reinforces separation of program between the lobby and gallery. The gift shop, designed as an exhibition space for merchandise, introduces track lighting with the addition of uplighting located above the display cases. 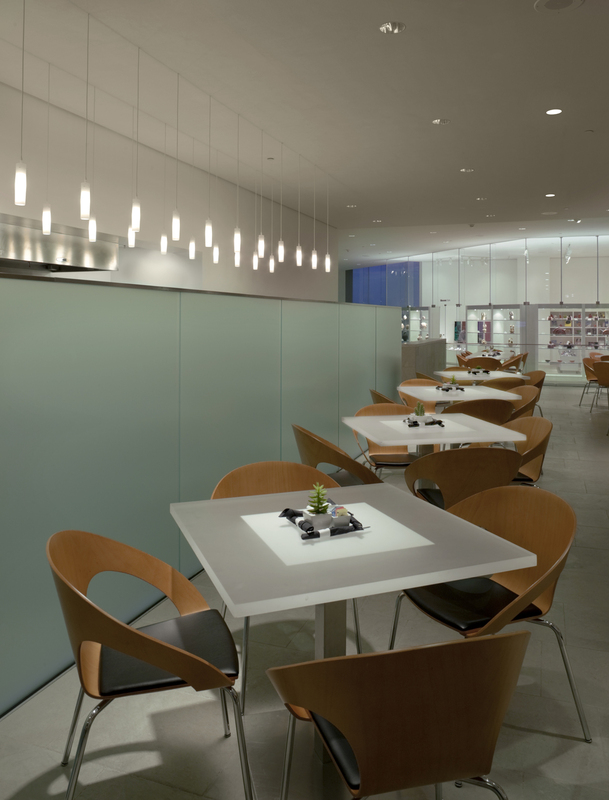 This introduction of indirect illumination further differentiates the shop as an autonomous space sitting within the lobby, otherwise denoted by the glass partition. The café, adjacent to the lobby, continues the same pattern of downlighting and introduces custom modified pendant fixtures. A special mounting detail was developed allowing the pendant cord to pass through the ceiling in an uninterrupted manner, eliminating the convention of a junction box and canopy at each fixture, maximizing visual focus on the suspended glass element. The atrium serves as a secondary entrance to the museum, gathering space and connecting link to the adjacent academic building. Here, the phenomenon of light, recognized through the seasonal and daily patterns of natural light and electric illuminance, is a transcending material giving character to the space. Architect: Kyu Sung Woo Architects, Inc.